A lot of things have happened since my last blog-post and the people who follow my facebook-page (www.facebook.com/c2c13) have seen some pictures already, but I’m going to sum up the events of the last week. The first big step was reaching the 4000km-mark which meant that I had reached 50% of my trip (probably more since it’s going to be a bit less than 8000km). 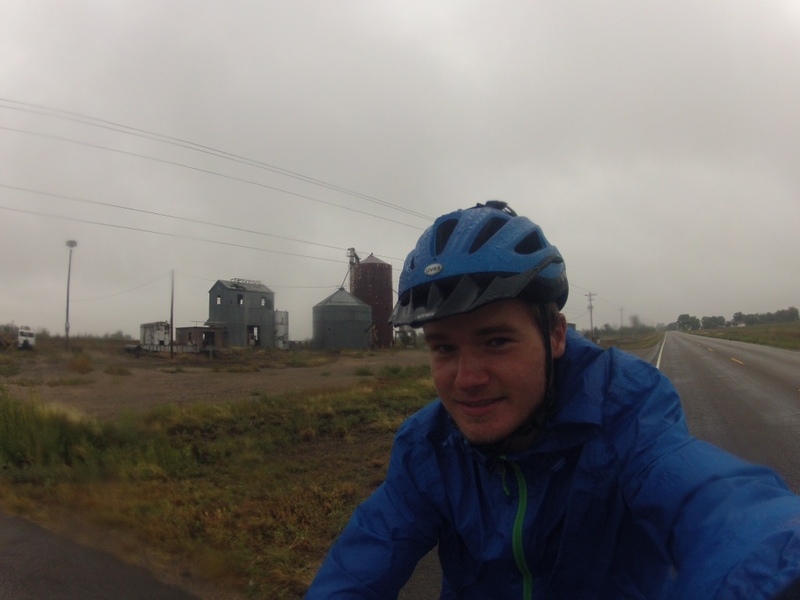 The moment itself was not that special though, since it was a wet and cloudy morning on my way to Pueblo. Reaching Pueblo was still a great feeling. 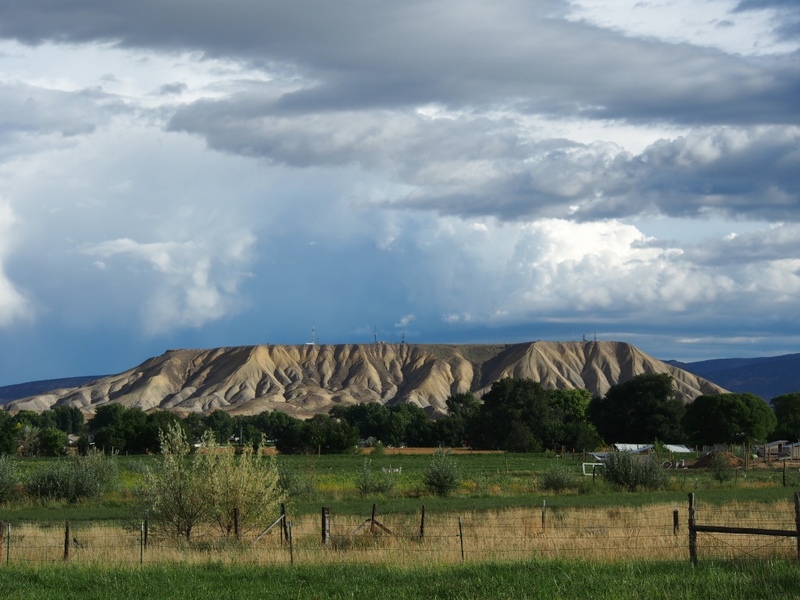 Ever since I had started planning this trip, Pueblo was an important step. I had set myself the goal of reaching it by the middle of September in order to avoid possible snowstorms in the mountains. I accomplished this goal by getting there on September 16th. Also, it definitely feels like I’m getting really close to finishing my trip which is weird since I still have thousands of kms to ride. But there are so many highlights coming up in the remaining states that I have something to look forward to pretty much every day. It is crazy, but I ‘only’ have about 26 days of cycling left until I will get to the Pacific Ocean in San Diego. Since my flight back is on November 15th and I want to get to San Francisco around November 9th, I now am in the luxurious position of being able to take my time, take days off when I’m in a nice area or the weather is bad – until now I was on a pretty tight schedule. 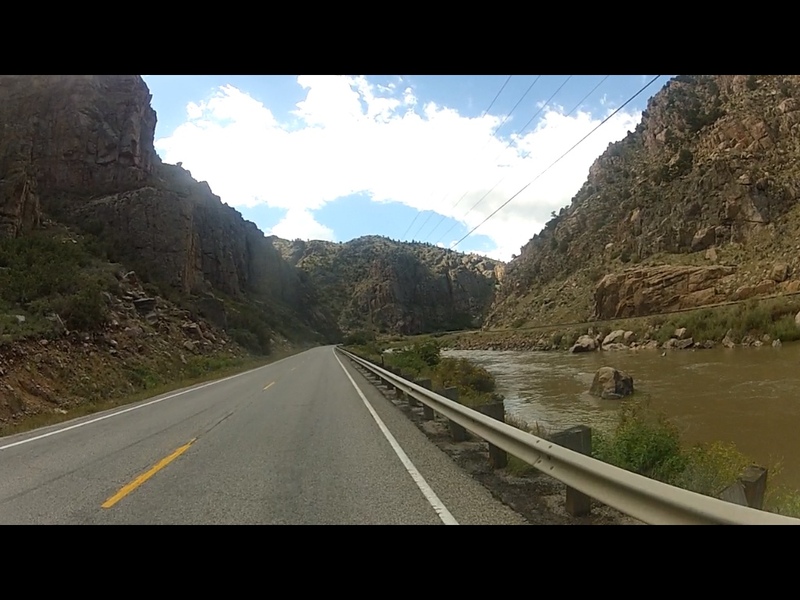 The ride to Pueblo itself was unfortunately not as great as I had thought. 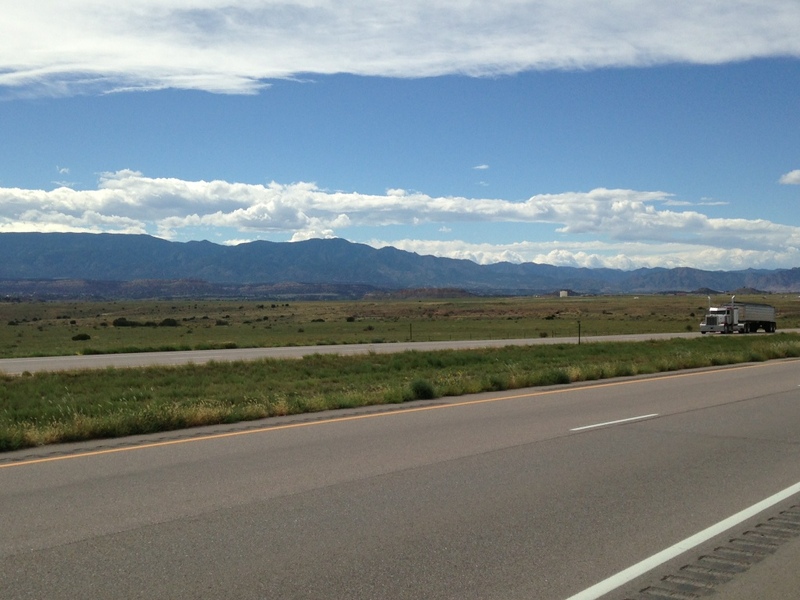 I was on a busy highway and since there were so many clouds, I didn’t get to see the Rockies yet. 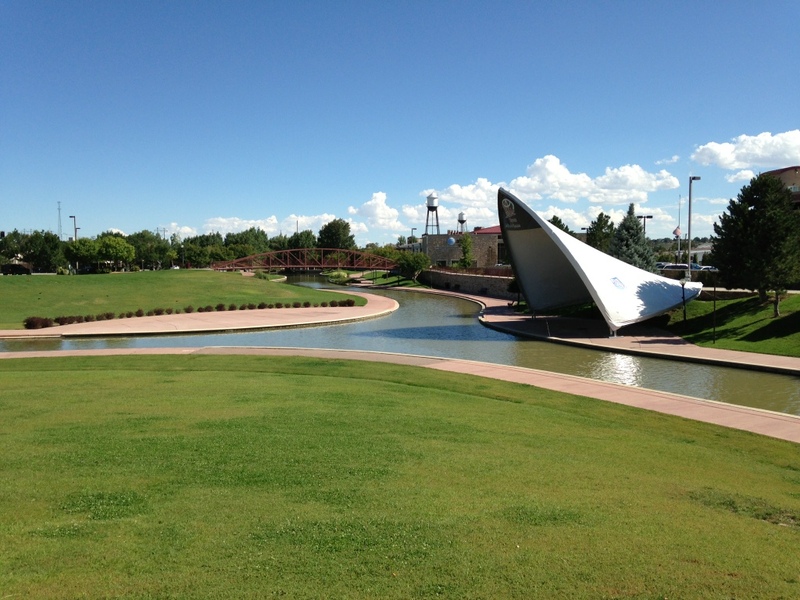 In Pueblo, I stayed with Monty, a couchsurfer, and had two relaxed days. A friend I met on my exchange in Barcelona, Megan, came down from Boulder to hang out for the day and it was nice to see a familiar person again for the first time in several weeks/moths. I also got my bike checked at the local shop and was really looking forward to the mountains. 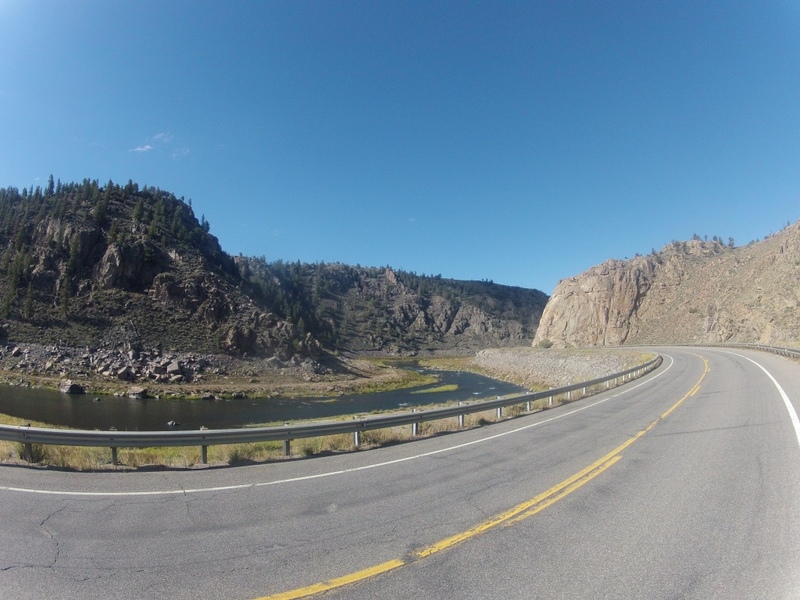 From Pueblo, I had a fairly easy day to Canon City, but the weather was great and so I did get to see the mountains for the first time and it was amazing. Riding through this desertlike area with big mountains in the background and thinking about where I had started over a month ago was great. In Canon City I stayed with Nic and Leslie. 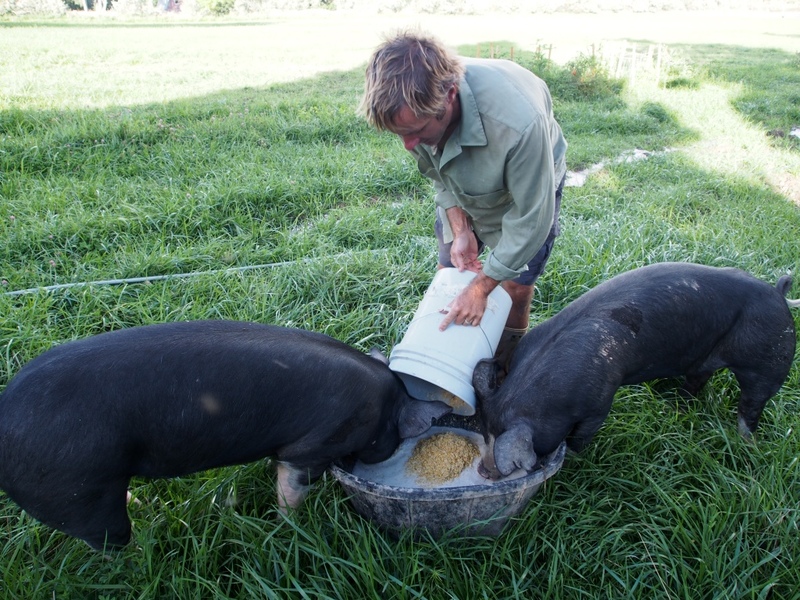 It is a cool story how I got to stay with them and again shows the hospitality of the people and the network you start to build on a trip like this. The two cyclists that stayed at the church with me where I wrote my last blog entry, Jason and Ryan, were sitting infront of the supermarket in Canon City eating a sandwich when Nic and Leslie came up to them and talked for a while. After a bit, they just told them to come to their house to shower and spend the night. So when I was at the church with them a week ago or so and told them I was going through Canon City, they told me I might be able to spend the night at this family’s house. They gave me their email-address and a day later Nic replied telling me I was more than welcome to stay. So instead of staying at a campground, I got to spend a night inside not worrying about thunderstorms and resting for my first big climb the next morning. 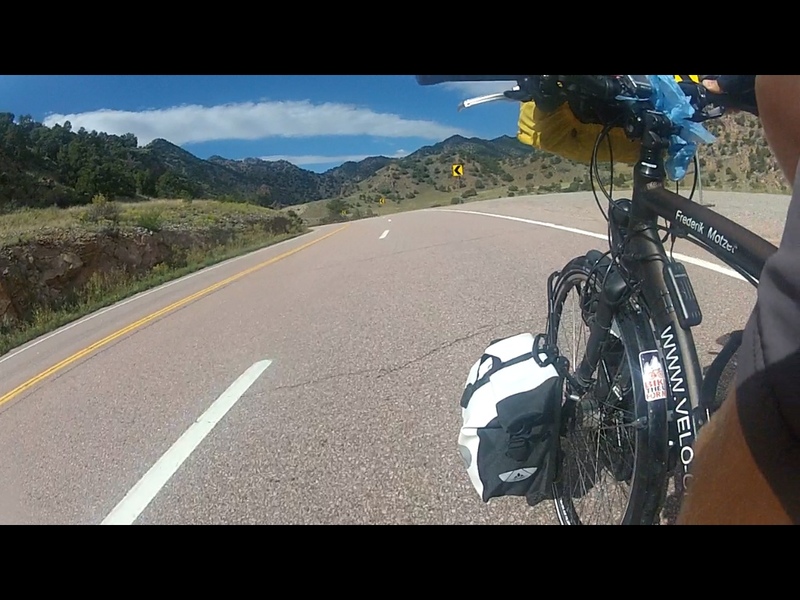 Out of Canon City, I had the first 12km climb and I indeed was in the mountains and will not really leave them until I reach the Pacific. 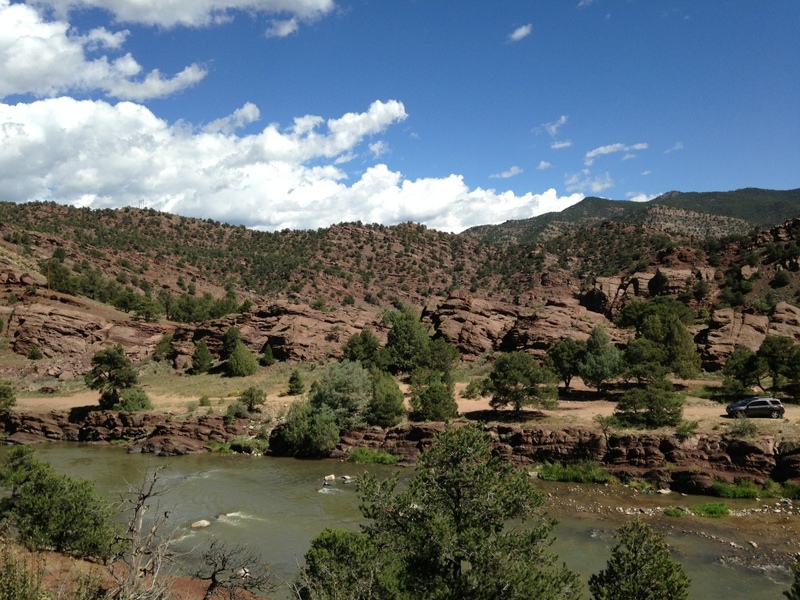 The scenery was beautiful – blue sky, red rocks, creeks, rivers and snow-covered mountains in the distance. It’s actually really hard to pick a few pictures for this blog that capture the views, but I guess there needs to be some kind of incentive to still do a trip like this yourself rather than just reading blogs ;). 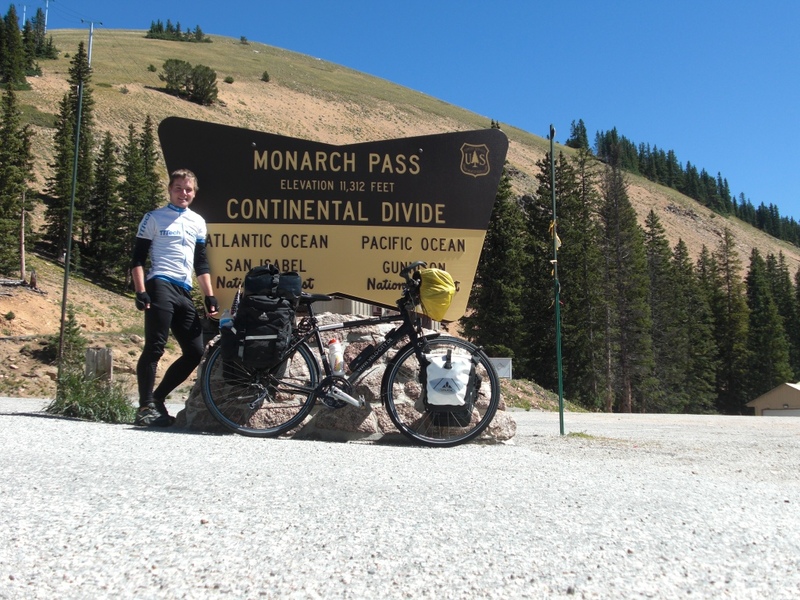 My day ended in Salida which was the gateway to my highest pass of the trip, Monarch Pass. 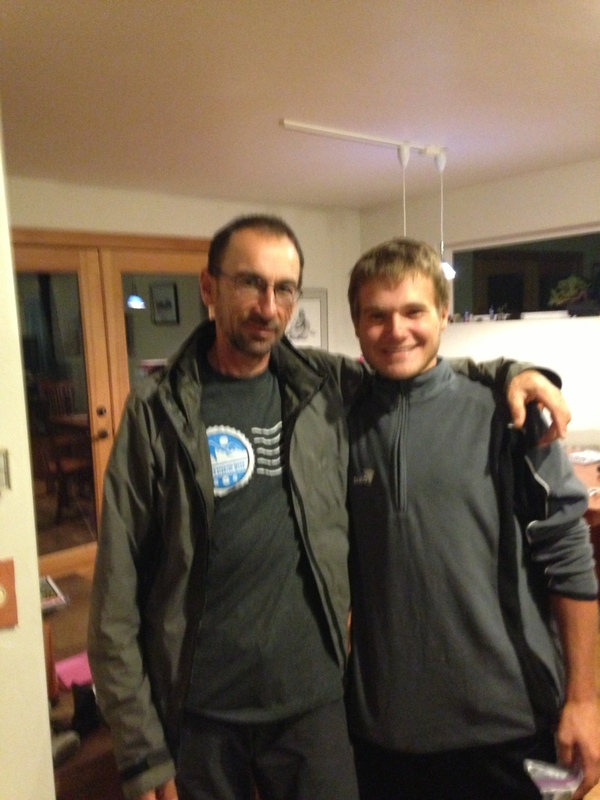 In Salida, I met this other cyclist from Basque/Spain, Lorenzo. He has been on his bike for 16 years (!!!). When he was 35, he quit his job as a high school teacher and decided to do a trip for not more than 18 months – and he is still on his bike. Every 5 years he goes back to Spain to visit family and friends, but he lives on his bike the rest of the time. He has been to every continent (except Antarctica) multiple times and is on his way from Canada to Mexico right now. It’s just unbelievable and talking to him made me feel like I was just on a quick ride to get some groceries or something. It was really interesting and inspiring to listen to all of his stories – but I don’t think I would ever be able to do that kind of thing. Still another great encounter on the way. 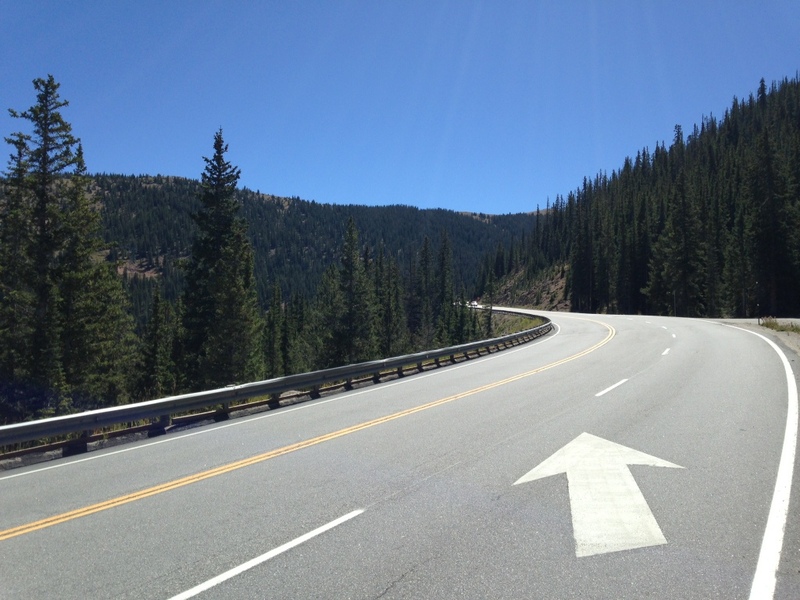 Then the big day had arrived – Monarch Pass was waiting for me. I had never biked up higher than 2400m before and I think the highest mountain I had ever been on before was 3200m. And this pass was up on 3447m – and I had to ride my bike up there. From Salida it was 40km uphill. The serious climb was about 20km with an average grade of 5%. 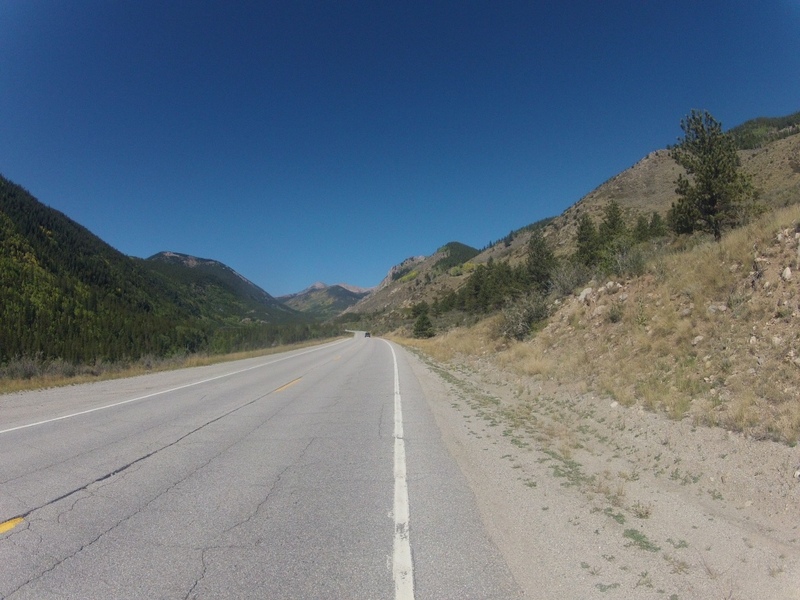 It’s hard to describe the challenge of riding up a pass on a bicycle to people who haven’t done it before. It’s as if you would go to the gym, get on one of those spinning-bikes, turn it to the highest resistance level and pedal for 4 hours straight. I do like it though, because it is really challenging and you always have to set yourself new goals. 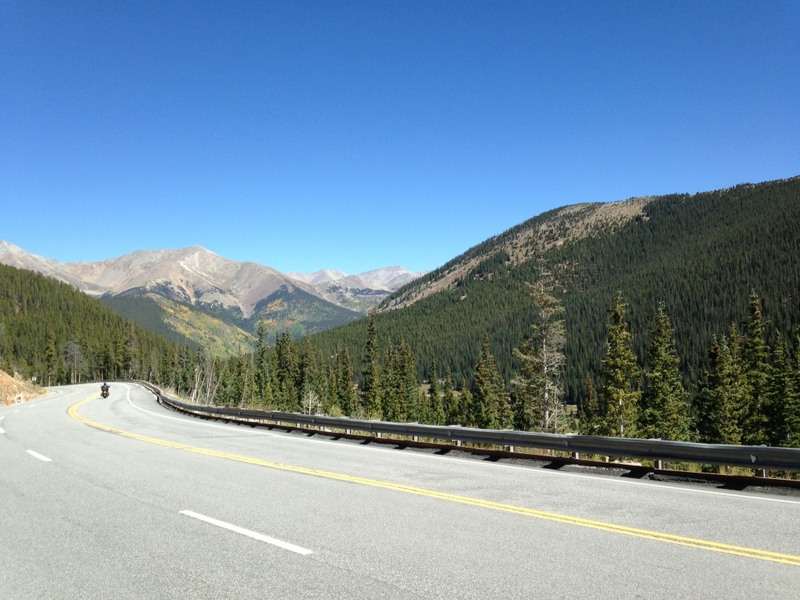 You also need to take frequent breaks so you don’t get sick of the altitude. Fortunately, I was feeling great that day, the weather was amazing and I really enjoyed the climb. Finally reaching the pass was probably the biggest moment on this trip so far. I chilled in the restaurant on the pass for a while and started to get a headache – thin air up there! So I decided that it was time for the descent – and that’s when you realize how much you had been climbing. You can just sit on your bike, not pedal and go down the mountain for about 20km at a high speed. I used the descent to relax and just enjoy the beautiful views. 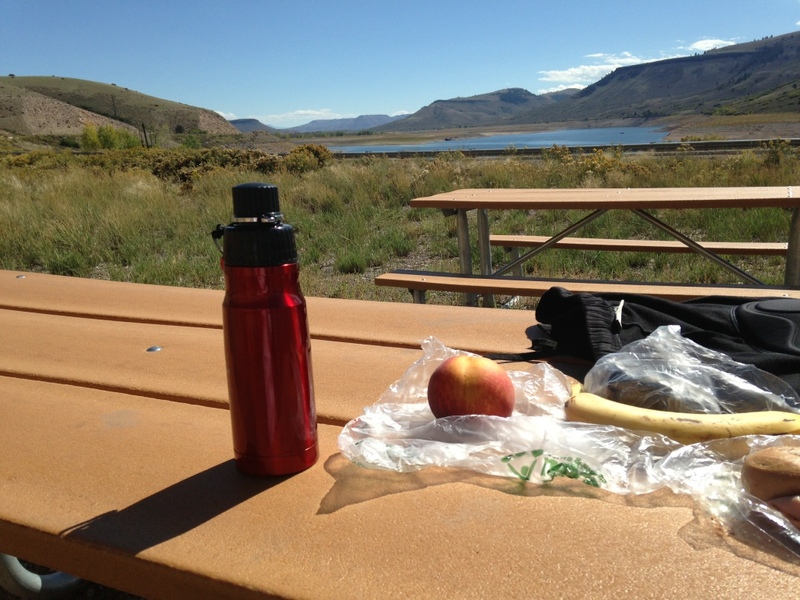 After the descent, I still had about 50km to go to my destination for the day, Gunnison. 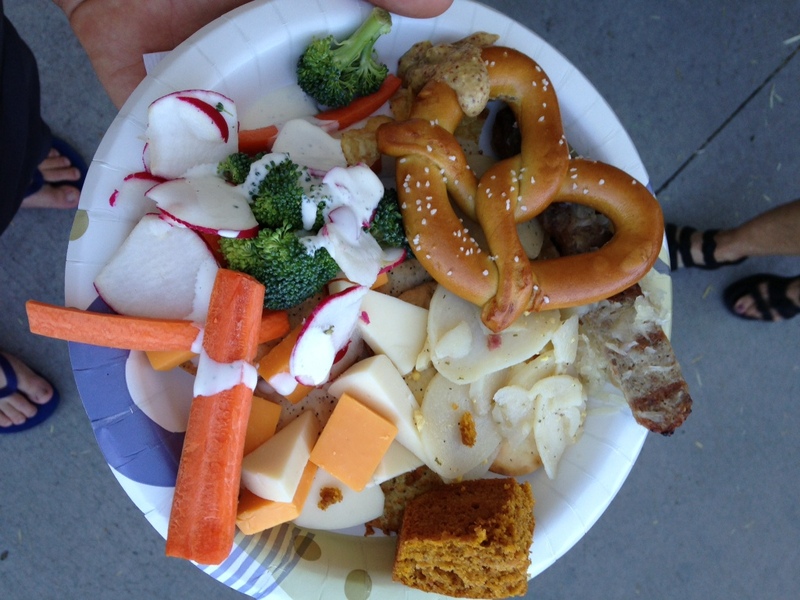 It was pretty easy though and when I got there, the “Oktoberfest” was waiting for me. 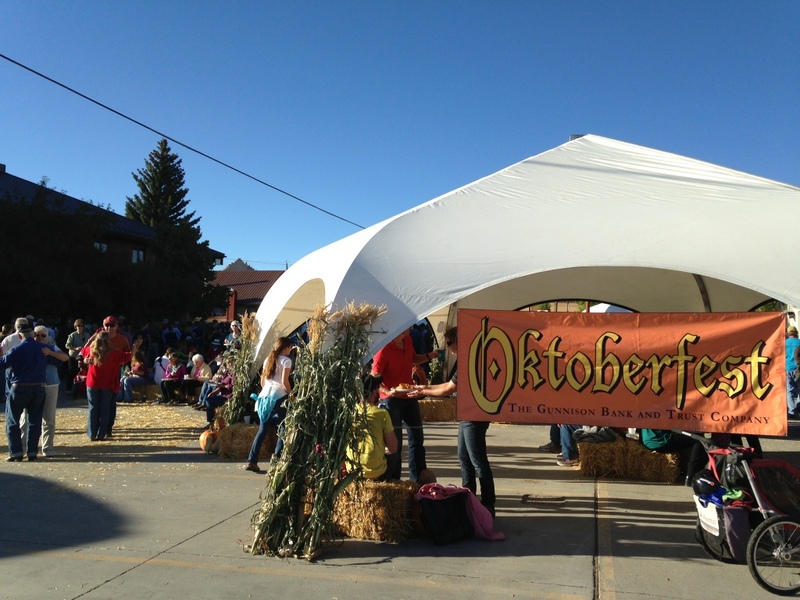 The little town’s bank had organized an Oktoberfest with a little band playing in Lederhosen, lots of German food (at least what they thought was German and catered by the local pizza-place) and beer (not German unfortunately). It was a nice atmosphere and a great way to end this day – Sauerkraut, Bratwurst and a Bretzel with mustard for free, what more could one ask for?! From Gunnison I took Highway 50 all the way to Montrose, where I am right now. It was another 105km and after the hard day before, I was feeling my legs a little bit and there were still some climbs – but ‘only’ up to 2500m. It was another great ride with beautiful views on the big lake and the cliffs that were bright red with the sun reflecting on them. 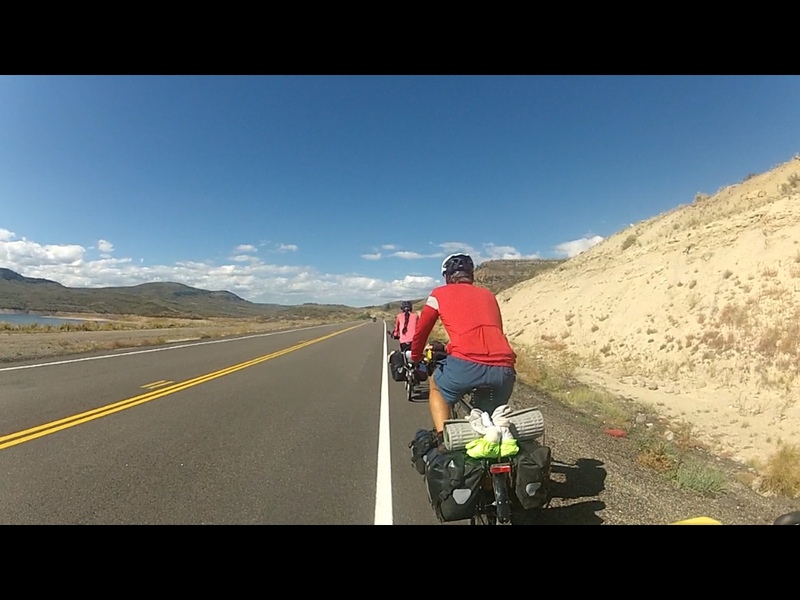 About 35km out of Gunnison, I spotted 2 other cyclists going the same direction as me just a few hundred meters infront. I started speeding up, caught up with them and rang the bell. Before I said anything, the guy just goes: “Freddy?!”. We rode together for a bit and talked and it turns out that Paul and his wife were on their honeymoon crossing the US and were staying at the same family – that’s how they knew my name. 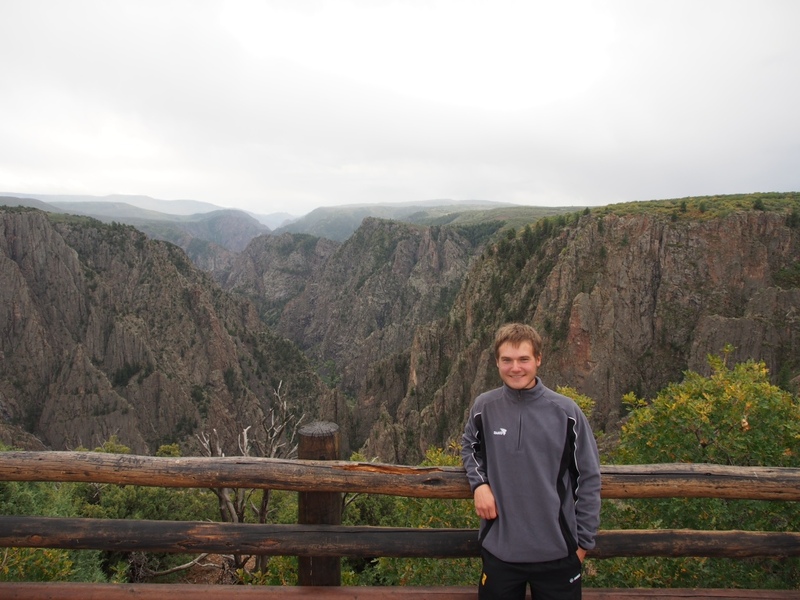 John and Emily also let us have another great experience: Montrose is really close to the Black Canyon National Park, but it still is 20km uphill and therefore not that great to do on a bike especially not in the rain. We talked about it and said that we might not do it because of the weather and John just goes: “Well just take a car – we have two anyways”. So it was time for a little roadtrip. Going up the steep roads, I was glad not to have done it on my bike. Especially since as soon as we got to the Canyon, we were in the middle of a thunderstorm. Lightning and thunder everywhere and it was nice to be in a car. Unforunately we didn’t have the best views, but it was still impressive (the canyon is about 700m deep and people say it’s actually nicer than the Grand Canyon – that’s debatable I guess). 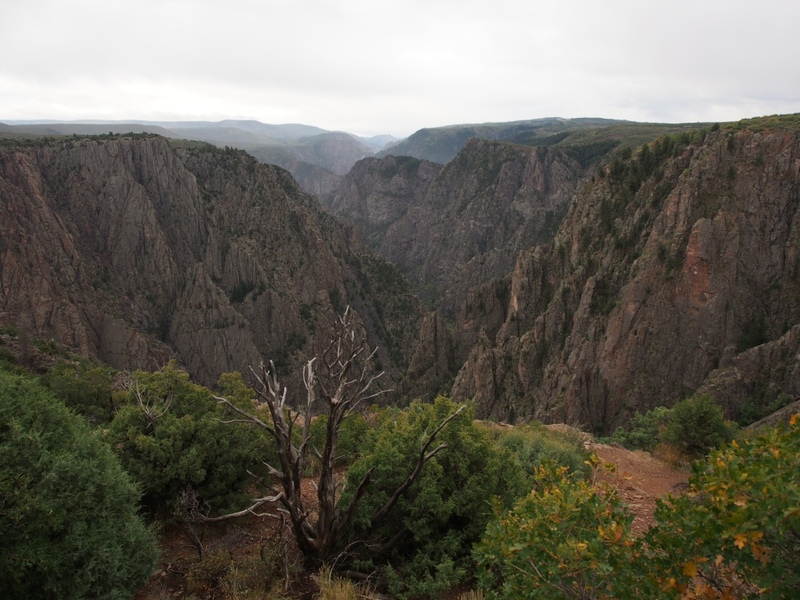 Black Canyon of the Gunnison – 700m drop! So, this was the weekly update again. 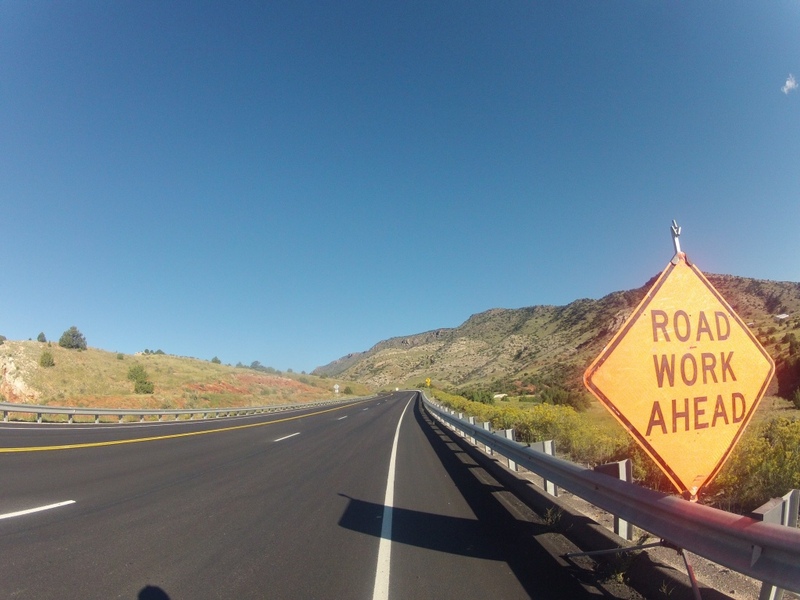 By the end of this week, I will probably cross the border to Utah and then it’s only one state before getting to California. 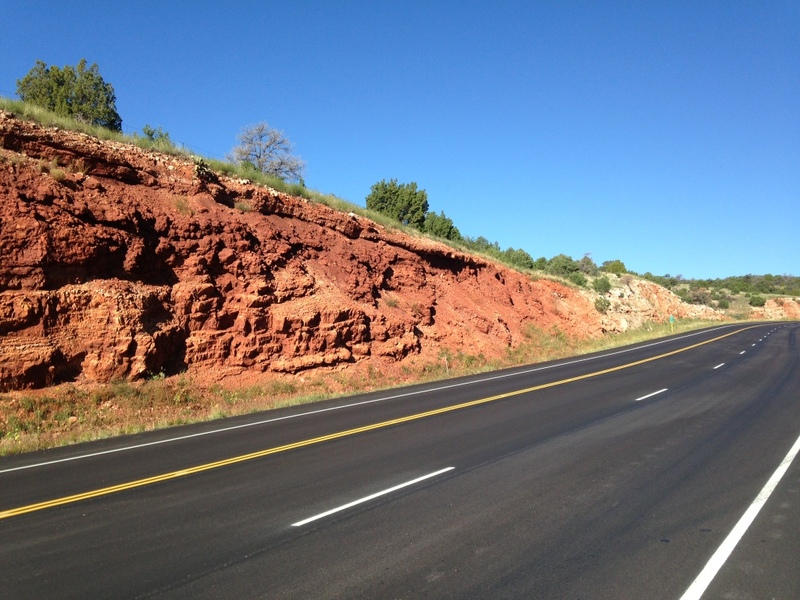 Utah is going to be a challenge, because of the mountains, the desert and the distance between places to get water. But I’m looking forward to it and just loving this adventure! Speaking of challenges: I noticed that I have (almost) caught up to the donations with a bit over 50%. So, if you are following my blog and enjoying it and have a couple of Euros to spare, I’d appreciate if you would donate on http://www.donare.de/Coast-to-Coast-2013 for Make-a-Wish Germany!